During the baseball and softball season, there are more than 5,000 youths on Blue Valley Rec teams. Add in youth basketball and volleyball and the number easily doubles. Volunteer coaches, most of whom are parents with kids in the league, are the backbone of our sports leagues, which is why we offer numerous clinics for coaches and character seminars for parents. Rob Miller of Proactive Coaching has been working with Blue Valley Rec coaches for six years and if you have ever wondered why, then you need to read Jeff Bollig's observations after talking to Miller at our clinic on Oct. 20. The statistics are depressing as much as they are startling. Surveys reveal 74 percent of children abandon team sports by the time they reach 13 years old. Rob Miller, partner of Proactive Coaching, says it does not have to be that way – nor should it. “Sports can be such a powerful teaching tool, but we as adults can drive them away because we do not make the experiences positive,” says Miller, himself a coach with experience at all age levels including intercollegiate athletics. 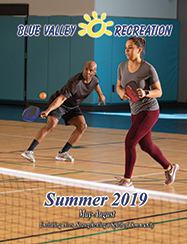 Miller’s comments came at Blue Valley Recreation Commission’s Off Court Training/On Court Coaching clinic conducted at Overland Trail Middle School in late October. His presentation was combined with an on court demonstration of basketball drills led by Blue Valley High School varsity coaches Dwight Williams (boys) and Ryan Mahoney (girls). The clinic fulfills part of the requirements by the National Youth Sports Coaches Association (NYSCA) to be certified and thus eligible to coach in Blue Valley REc programs. Quitting sports is not necessarily a negative as Miller indicates it is important for youth to find their passion and have a desire to learn and develop. However, he says two red flags arise in the responses of youth as to why they quit: 1.) burnout; and 2.) relationship with coaches. How do coaches prevent those negative aspects? Regarding burnout, there is a growing trend to start competitive sports at an earlier age and greater intensity in competition and expectations. The pressure forces children to search for other options, many of which can be detrimental such as video games, excessive television or even illegal activities. Coaches, who often times are not trained to be in such a position, make the experience negative by being overly demanding and critical. Miller says it is important for coaches to understand youth development stages. He said that the “joy” stage lasts through 8 years old, with a needed emphasis on having fun and helping children understand behavioral norms of being on a team. Because kids cannot comprehend the technical aspects of training until about age 5 or 6 , heavy training on fundamentals is not going to be learned or retained. The “fundamental” stage lasts through age 13 and focuses on developing skills, with aspects of the joy stage woven in to keep the activity fun. The “competitive” stage lasts through age 18, where playing time and positions are earned, and wins and losses are emphasized more. The “mastery” stage begins in college and continues through professional competition. To avoid the pitfalls that can lead to negative experiences, Miller says coaches can develop their own program of Plan-Teach-Motivate-Build. The planning element should establish practice routines, outline expected behaviors, consequences of non-compliance, and communication avenues for parents, etc. Having these elements established from the outset fosters efficiency for coaches, parents and players; and helps to avoid confrontation. Teaching, especially for the younger ages, should be based on a process. Specific skills should be defined (What is a box out? What area is the paint? What is a jump shot? ), those skills should be modeled (demonstrated), incorrect actions should be addressed and positive aspects should be reinforced. In addition to fundamentals, character skills should be taught as well in the same manner. Motivation refers to the verbal and non-verbal techniques coaches use to improve performance. Miller says coaches often-times use the element of fear, but any improvements from this tactic are short-term in nature and in the long-term lead to a regression in performance. Coaches must build trust, establish standards of discipline, and be cognizant of pressures that exist such as excessive losing, complex instruction and negative reinforcement from coaches and/or parents. The last element of a coaching program is to build the team concept. Miller points to the importance of developing a “culture” that defines expected behaviors of team members, which actually trumps the tactical schemes coaches may create. Important elements of the team concept are all roles that have equal balance, discipline should not be based on talent levels and the success of the individual should not come at the expense of the team.